The difference between mobile banking and Internet banking has mostly disappeared with fast and feature-rich smartphones coming into play. The unprecedented fall in data cost is further driving mobile apps usage, thus opening up new growth opportunities for financial institutions. “In 2019, due to increasing Internet penetration, products will be developed to facilitate a frictionless banking experience to non-tech-savvy customers by leveraging photographic guidance, vernacular videos and AI assistance,” says Rajan Pental, Senior Group President, Branch and Retail Banking, at YES Bank. It also means an exciting digital future for customers looking for a seamless experience, intelligent features and added value. Here is a quick look at how the payment landscape will evolve in 2019. Cash to grow but digital payment will grow faster. 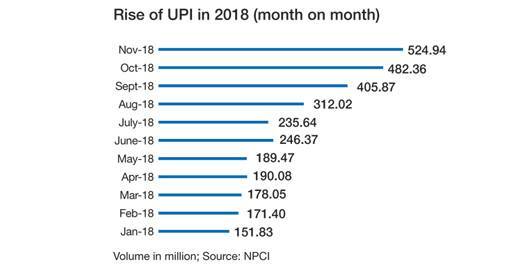 The Unified Payment Interface (UPI) has revolutionised the digital payment ecosystem in India (see chart Rise of the UPI) and the recently updated version is expected to grow at a fast clip. “For banks and payments players, UPI has been the biggest game changer in 2018, having breached the 500 million transaction mark in November. A payments technology like UPI stands unparalleled, even globally, especially in terms of scale it can achieve in the forthcoming years,” says Bhavin Shah, Partner, Financial Services Tax Leader, at PwC India. But the rapid growth of payment digitisation does not mean a decline in cash transactions. “Although digital payment options have grown over the past year, cash withdrawals from ATMs are going up every month. Cash continues to be the preferred mode of payments,” says Ramaswamy Venkatachalam, Managing Director (India) at Fidelity Information Services (FIS). Payment players to follow data localisation mandate. Global payment companies such as Mastercard and Visa will have to comply with the central bank’s mandate and store all transaction data of Indian customers at local servers. Also, this data will have to be removed from their overseas locations. The step was taken by the Reserve Bank of India to ensure higher safety and privacy of domestic payments data. In 2019, most of the players in the payment industry are expected to start saving the data locally. WhatsApp payment to be rolled out. Google Pay is already up and running while WhatsApp is planning to launch its payment services soon for all Indian users. The company ran a pilot at the beginning of 2018 and has now sought RBI approval to launch the service. Given its vast user base and huge popularity, the new feature could have a major impact. Prepaid wallets may get interoperability. 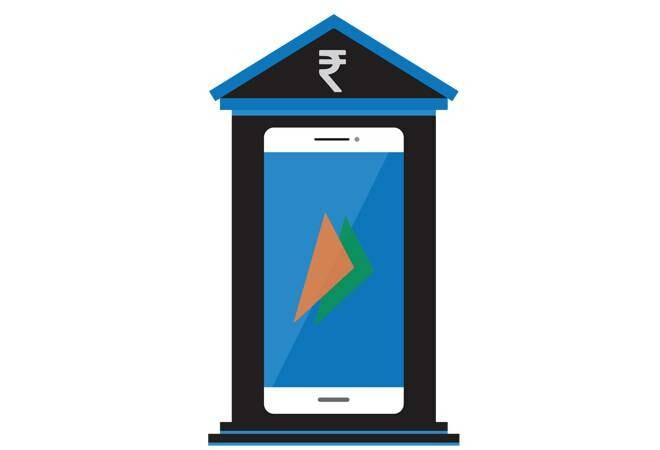 Although IMPS allows interoperability among banks on Web and mobile platforms, prepaid instruments (PPIs) such as mobile wallets and cards lack this feature in spite of the guidelines released by the RBI in October. The central bank said that PPI interoperability would be done in a phased manner – between wallets and between wallets and banks through UPI, and for cards, through card networks. “Mobile wallet interoperability could finally see the light of the day but with a condition of higher capital requirement. RBI is yet to allow transactions between mobile wallets, but the digital payments industry is abuzz with talks of an imminent announcement of the final guidelines,” says Venkatachalam of FIS. New method for offline Aadhaar authentication. The government is working with multiple regulatory agencies to implement an alternative of online Aadhaar authentication by private players, which has been barred by the Supreme Court. The most significant proposal that is likely to be adopted is the use of QR code for offline verification. The UIDAI may allow an Aadhaar holder to get a printout of his/her Aadhaar details in a QR code format, which can be scanned by private players to do offline verification of name, address and other information without getting access to the Aadhaar number. This may come as a respite for many fintech companies adversely hit by the Aadhaar verdict. BBPS, BHIM and Bharat QR codes to expand. The National Payments Corporation of India (NPCI) launched the Bharat Bill Payment System (BBPS) on October 17, 2017. Since then, 107 billers with more than 2.4 million agent outlets have been integrated with the system. As of now, 62 banks and 10 non-bank entities function as Bharat Bill Payment Operating Units in India. BHIM (Bharat Interface for Money) QR code, built to facilitate UPI-based transactions, and Bharat QR code, which enables card-based transactions, is likely to see higher traction in 2019. “It will be especially interesting to see how P2M (person-to-merchant) transactions evolve with Bharat QR and BHIM UPI QR, which will enable customers to transact using a mobile phone across online and physical merchants,” says Ritesh Pai, Chief Digital Officer at YES Bank. Although fintech companies have pioneered digital payment innovations in India, banks are not lagging behind. Most of them have gone all out to bring these features on their platforms. Many experts think it will be a mix of competition and collaboration among banks and fintech firms that will determine the future course of payments. But the role of regulators will also assume great significance when it comes to integrating innovations in the current ecosystem.